When Dean Austin was sacked at the end of September, Town were in deep trouble at the wrong end of Sky Bet League Two, having won just one of their opening 12 matches in all competitions. They travel to Devon this weekend in 16th place, 10 points above the drop zone, and within seven points of the promotion play-off places. Curle’s record has been impressive, winning six, drawing two and losing two of his 10 games in charge, and he has added a mean streak to a Town team that was previously seen as a soft touch. Even in last Saturday’s FA Cup first round loss at Lincoln City there was cause for genuine optimism, with the team doing brilliantly to battle back from 2-0 down to level at 2-2, before Bruno Andrade won it for the home side in time added on. And van Veen says that Sincil Bank fightback is something that would not have happened under the previous regime. “We’ll go to Exeter with confidence,” said van Veen. “The last few weeks have been amazing. Since the new gaffer has come in a lot of things have changed and we’ve all got such belief. 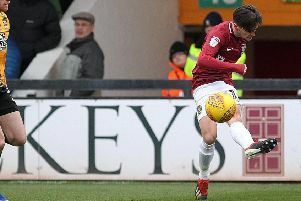 “As Cobblers, at the start of the season if we were 2-0 down at Lincoln, we wouldn’t have turned that around but even at 2-0 behind on Saturday we were looking like we’d win the game. So what is it about Curle that has transfored the team’s fortunes? “I thought Dean Austin was a good manager and he did the right things but it’s hard when you play good football and keep losing,” said the Dutchman, who was a six-figure signing by then manager Jimmy Floyd Hasselbaink in the January transfer window. “What’s changed with this gaffer is that it’s very demanding and he’s very honest and strict with a lot of things. “If you’re messing about, he’ll tell you. “He’s demanding and the way we need to play football our work ethic is important.